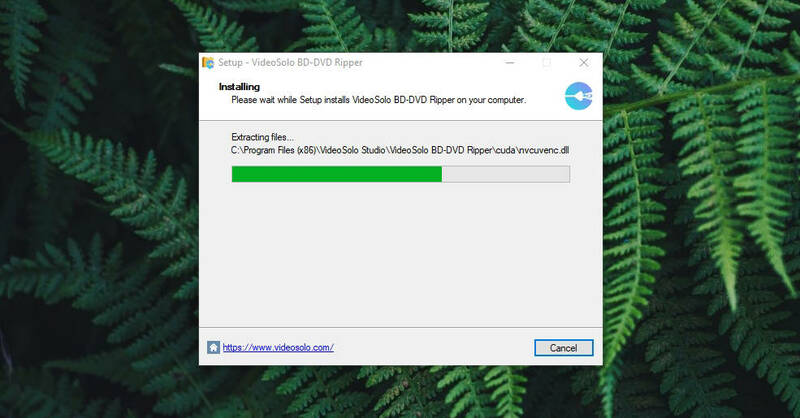 VideoSolo BD-DVD Ripper Review - The Easiest Way to Rip DVDs & Blu-Rays! 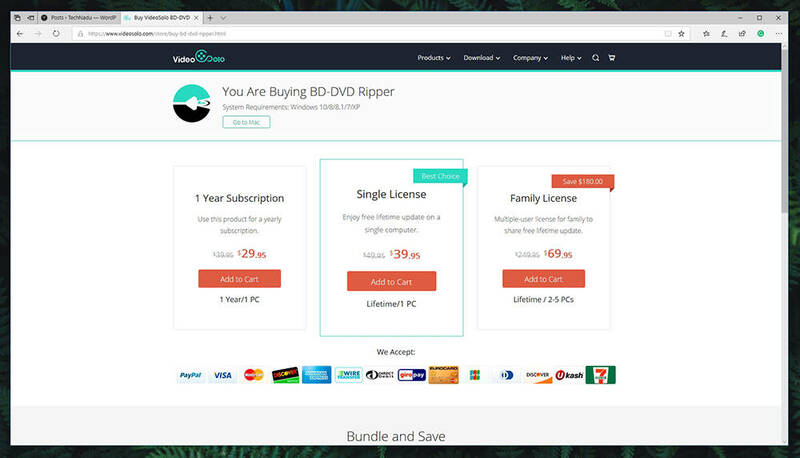 VideoSolo BD-DVD Ripper Review - The Easiest Way to Rip DVDs & Blu-Rays! This post is sponsored by VideoSolo. We have a wide selection of tools for ripping DVD and Blu-Ray discs at our disposal. However, only a few are capable enough to be your go-to tool. The main differentiator between these is their ease of use and performance. After all, you want a tool that can convert your DVD into a high-quality video file without taking hours to complete. This is precisely what we’ll be looking at today, so welcome to our review of VideoSolo BD-DVD Ripper. Before we dive deeper into all kinds of specifics, let’s take a look at the basic information about VideoSolo BD-DVD Ripper. Unique Features Converts to 4K UHD and HEVC files; Stellar performance; Advanced filters, effects, and optimization tools; Numerous preloaded conversion profiles. Price $39.95 (free trial available). Now that you know the basics about this interesting piece of software, we’ll take a look at its biggest benefits and drawbacks. So, the following table should come in handy if you’re comparing this tool to other options present on the market. Pros Very easy to use; Great for inexperienced users; Numerous conversion profiles; Advanced video editing; Conversion to a 3D movie format. Cons Could benefit from a more refined support system. Final Verdict In case you need a simple yet highly powerful video conversion system, VideoSolo BD-DVD Ripper should be your pick. Plenty of interesting features await. In case you like what this DVD ripper offers so far, keep on reading to discover the specifics. Let’s dive deep into our VideoSolo BD-DVD Ripper review. Just like with other product reviews on TechNadu, we will start with the basics. You will get to learn how easy it is to install this application, what kinds of features to expect, as well as what are its capabilities. Our goal is to tell you if VideoSolo BD-DVD Ripper is worth its price tag, so make sure to read this article carefully. Before we start, we’d like to say that we’ve tested the 1.0.8 version of VideoSolo BD-DVD Ripper on a Windows 10 PC. Since its performance depends on how powerful your CPU and GPU units are, we need to inform you that our PC (used for testing) is powered by Intel Core i7-8700K and it uses Nvidia GeForce 1070Ti for its GPU needs. 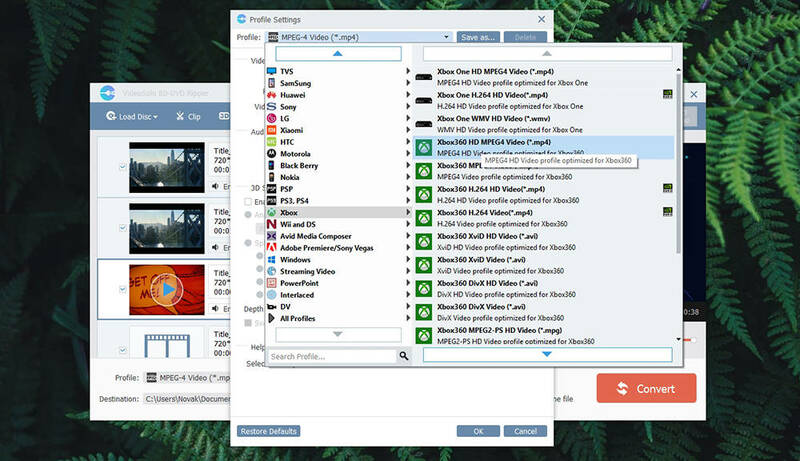 VideoSolo BD-DVD Ripper is available for Windows and Mac computers – offering pretty much the same app across these platforms (in terms of its UI and available tools). Our Score: 10/10. 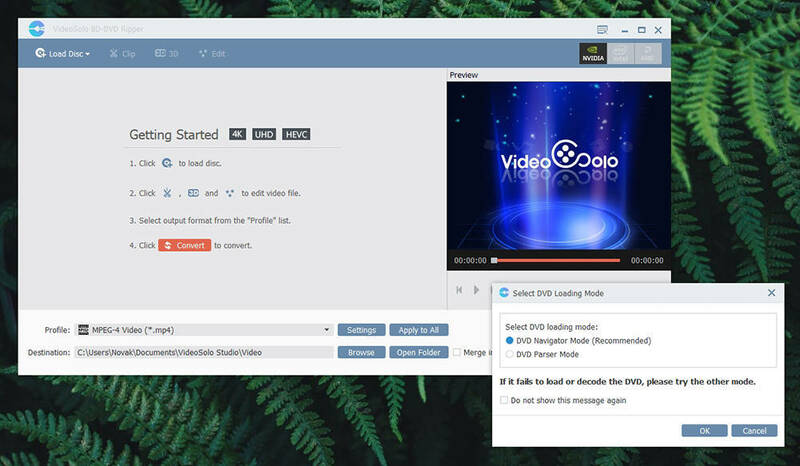 No matter if you have a Windows PC or perhaps one of Mac computers, VideoSolo BD-DVD Ripper offers the same user experience across both of these platforms. The biggest difference is between GPU units, where Windows PCs offer plenty of GPU processing power while Macs are powered by discrete graphics or dedicated AMD units. In general, the more powerful computer you have – the faster the conversion rate is going to be. It’s also worth noting that updates containing bug fixes and refinements are being published for Windows and MacOS at the same time. There aren’t overly frequent updates, which is not a bad thing considering that the current state of this tool is quite polished. You can install VideoSolo BD-DVD Ripper in a matter of minutes. The application isn’t trying to offer special ‘deals’ or any kind of bloatware. Our Score: 10/10. 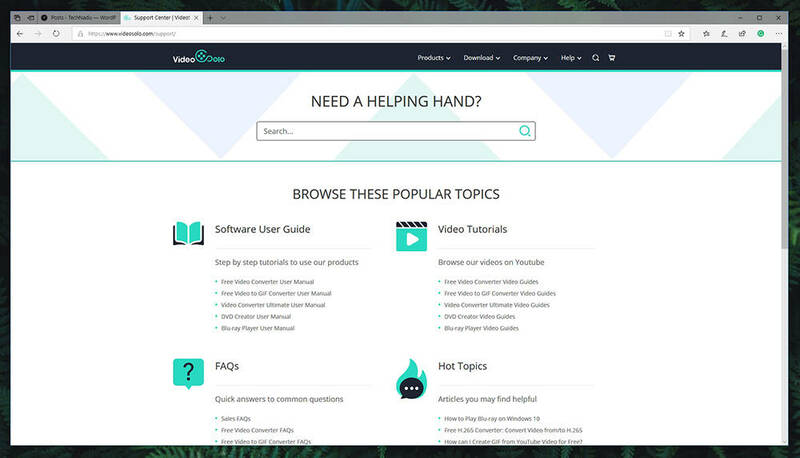 To get started, you need open the official site of VideoSolo. The operating system of your computer should be automatically recognized, so you can jump to downloading the required file straight away. Click on the prominent ‘Download’ button and you’ll be on your way. The installation file is around 37MB big, which means it shouldn’t take too much time to be downloaded. The installation file for MacOS (dmg file) is around 49MB in size. Once you have the file on your Desktop, double-click on it. You need to go through a few installation steps (nothing extraordinary or unusual here) and that’s pretty much it. Once installed, run the application by double-clicking on its icon. Comparable software options tend to oversimplify things. 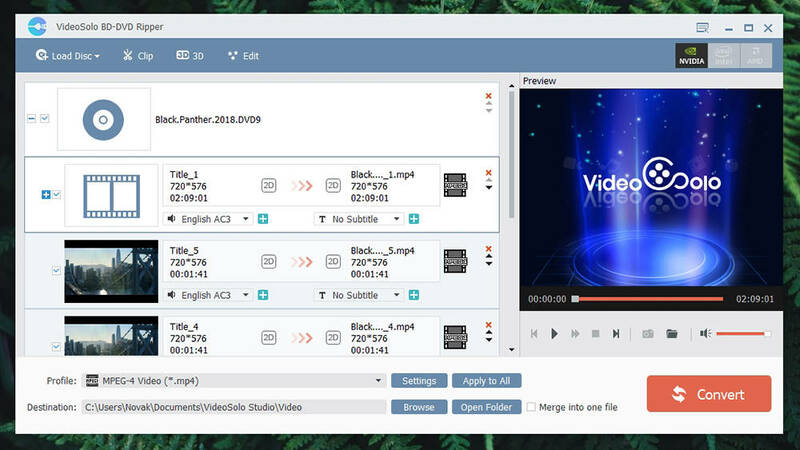 VideoSolo BD-DVD Ripper is easy to use, yet highly polished in terms of its UI design. Our Score: 10/10. When it comes to DVD rippers, many applications out there bring dated interfaces. They usually come with prominent and shiny buttons that remind us of applications released in the early 2000s. This isn’t the case with VideoSolo BD-DVD Ripper. You will get to see a very simple UI that somewhat reminds us of Android’s Material design. This means simple navigation bars and flat colors. In the top-placed (blue) bar, you will see all the tools that are at your disposal. This is where you can load a DVD or Blu-Ray disk, and then make all kinds of adjustments using tabs like Clip, 3D, and Edit. In the top-left corner, you will see which technologies this application is using. In our case, ‘Nvidia’ is highlighted since VideoSolo BD-DVD Ripper is going to use our powerful GPU unit to the get the job done. The rest of the interface is pretty self-explanatory. The main portion is reserved for your video, while you can see its preview on the right side of the screen. At the bottom, you can choose a conversion profile. Click on ‘Settings’ to reveal all of them. There is a huge list of options that can be filtered by different devices including mobile devices, media streaming devices, computers, consoles, and pretty much anything in between. It’s also worth noting that there’s a somewhat hidden settings section. Right next to actions like Close, Maximize, and Minimize (top-right corner), you’ll see the Menu button. This is where you can choose from different languages, check out support, update the application, and – open the application’s Settings. You will see three tabs, so here’s what they can do. 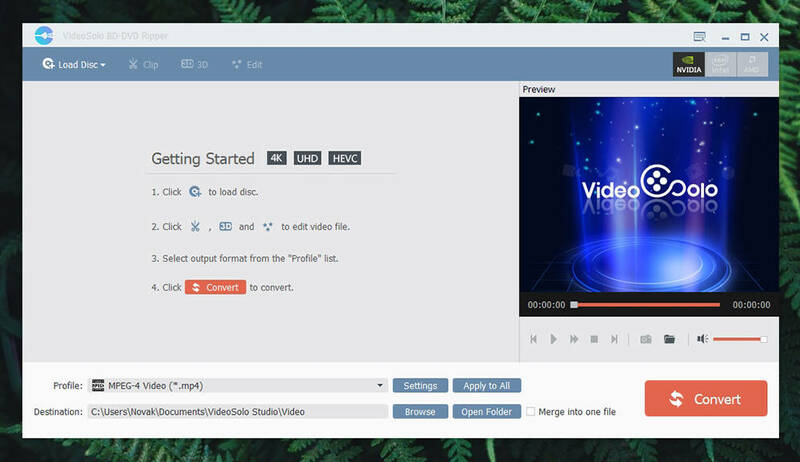 General: This tab lets you set a default path for saving video files, as well as any snapshots that you might make. As such, this option is useful if you convert DVDs or Blu-Rays often since you don’t have to pick the output folder every time you do that. Convert: Now, here’s where you can fine-tune the application’s performance. In case you have a powerful CPU and GPU units, you can enable/disable prioritization as well as technologies that could get the job done in a quick way. In general, the application is already set to take full advantage of your computer. Also, there’s an option at the top of this tab that lets you shut down your computer on the conversion is done. DVD: The final tab brings different ways to browse your DVDs. This applies to how the application acts once you load a DVD or Blu-Ray disk. In general, the default values should do the job for most people. Even though the application bombards you with plenty of options, it’s still easy to use. Even inexperienced users should not have any problems ripping DVDs and Blu-Ray discs. Our Score: 9/10. To explain how VideoSolo BD-DVD Ripper works, it’s best to take you through the process of ripping a DVD. So, here’s our step-by-step guide on how this works. The first step is to load your disc. Click on ‘Load Disc’ and the application will present a list of DVD chapters. This is where you can decide which chapters you want to include, change between different audio languages and even add subtitles (internal or external ones). At any moment, you can use three additional tools from the main toolbar: Clip, 3D, and Edit. 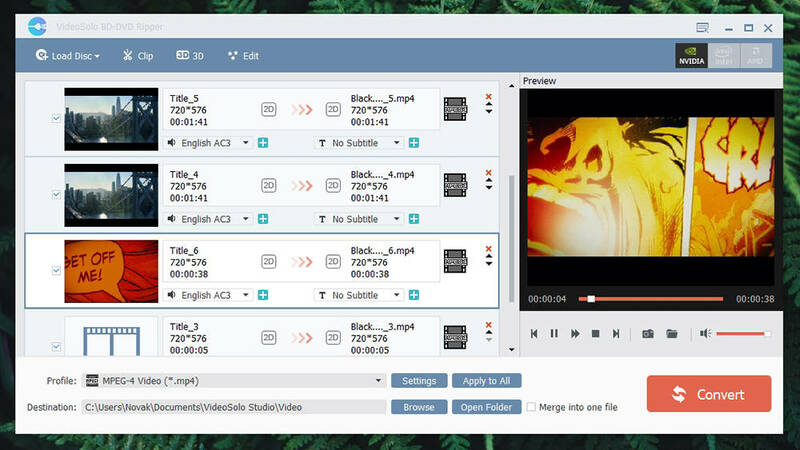 The ‘Clip’ tool lets you trim videos, as you might expect. Then, the 3D tool lets you transform your DVD into a 3D movie. There are different ways you can do this, depending on what kinds of 3D TV, monitor, or VR headset you’re using. And finally, you can use the ‘Edit’ tool to rotate the video, crop it, add all kinds of watermarks as well as effects. At the bottom of the screen, you can select from different output formats. There are hundreds of different profiles already present. All you need to do is to pick a device. Once you’re ready, click on ‘Convert’. All there’s left is to wait for your DVD or Blu-Ray disc to be converted. Thanks to its support for Nvidia, Intel, and AMD – you can expect stellar performance. You’ll end up with a high-quality video file without any loss of quality whatsoever. Our Score: 9.5/10. How fast this application does its job largely depends on your computer. 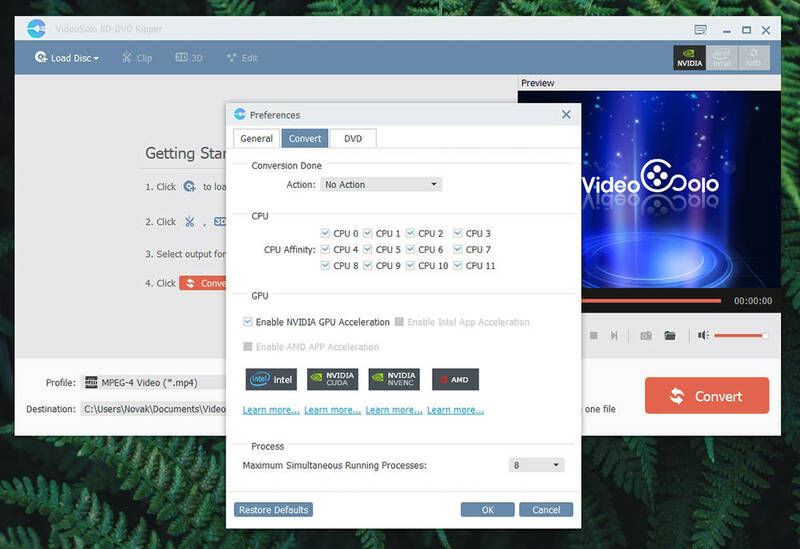 Video conversion is something that takes all your computer’s resources, including its CPU and GPU unit. 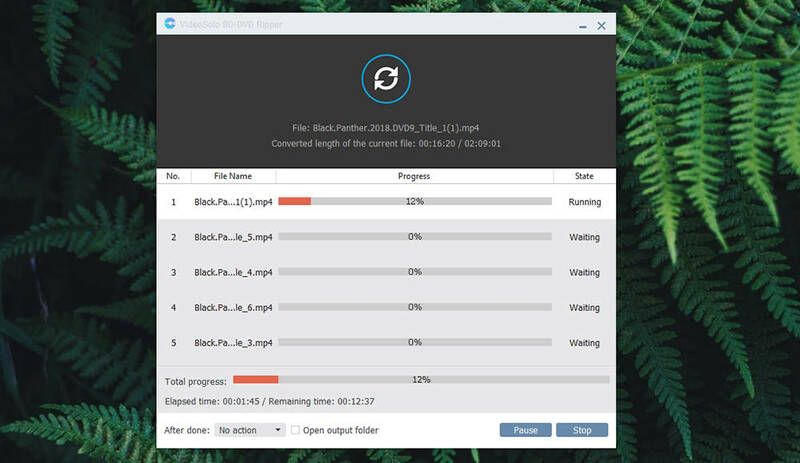 For the sake of testing VideoSolo BD-DVD Ripper, we have decided to convert a recently released Black Panther movie (around 135 minutes long). We chose to use the MP4 format and the entire process was done in around 13 minutes. So, amazing performance all around. No matter how easy to use this type of software can be, you don’t want to be left out in the cold. 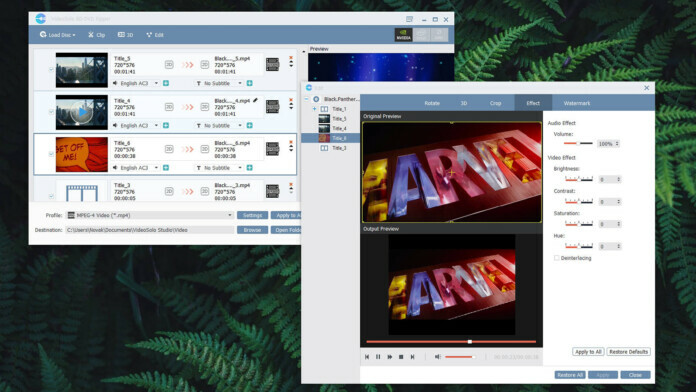 To help you with this, VideoSolo BD-DVD Ripper offers Web-based support. Our Score: 7/10. In case you’re having any problems with this application, or if you want to expand your knowledge on how to use it, the best place to start is the official support page. 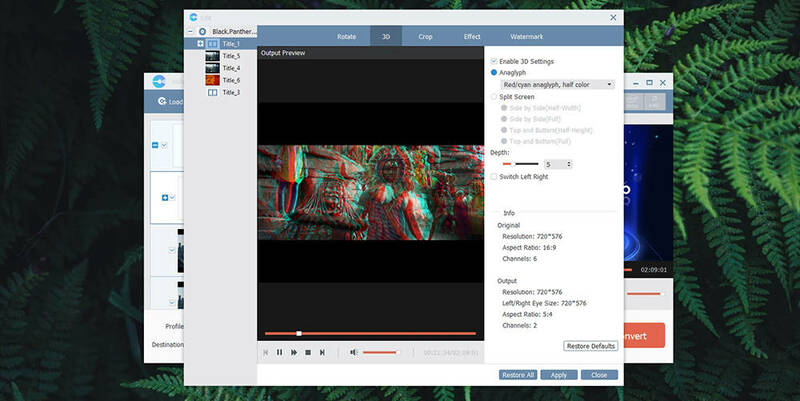 The main problem is that VideoSolo offers a bunch of similar software products, all aimed at converting video files. To learn about the BD-DVD Ripper, you actually have to click on the ‘Video Converter Ultimate’ link. This is a similar software solution that allows you to convert files (not just discs). So, everything said on that page still applies to the software we’re talking about in this article. In case you can’t find what you’re looking for, your next best bet is to contact the support team. This can be done only via email, as seen at the bottom of the support page. In case this doesn’t help, you can always turn to social media since VideoSolo BD-DVD Ripper has its own Facebook and Twitter page. VideoSolo BD-DVD Ripper brings several plans, depending on how frequently you need to use this application. So, this is a custom-tailored option that should work for everyone. Our Score: 9/10. One Year Subscription is priced at $29.95 and as its name says – this gives you a full license that lasts for one year. In other words, this is an annual subscription. Single License is priced at $39.95 and comes with unlimited use. When you buy this license, you will get a lifetime use with all future updates covered. Family License is priced at $69.95 and it covers up to 5 computers. It also includes a lifetime of free updates. It is also worth noting that there are more than a dozen different payment methods that include all major payment cards, PayPal, WeTranfer, and more. PROS: Nicely designed UI; Simple to use; Hundreds of conversion profiles included; Support for Nvidia, Intel, and AMD; Advanced editing; 3D conversion. CONS: Not the most helpful support system out there. So, that would be all when it comes to our review of VideoSolo BD-DVD Ripper. In case you have any questions, don’t hesitate to post a comment below. You can be sure that you’ll receive a timely response. Finally, we’d like to ask you to share this article online. To stay on top of the latest information, don’t forget to follow us on Facebook and Twitter. Thanks! 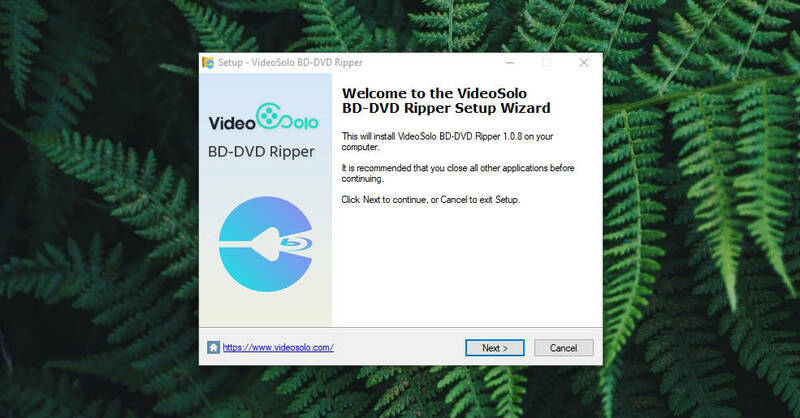 VideoSolo BD-DVD Ripper is simple to use – yet highly advanced. It can convert DVDs and Blu-Rays using advanced hardware acceleration methods and comes with hundreds of conversion profiles. What’s not to like here?